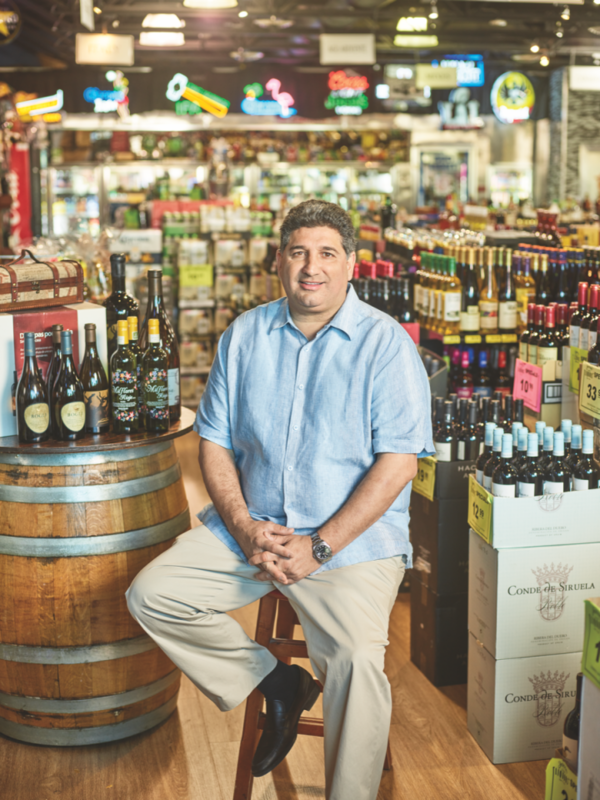 The Cruz family’s involvement in the business began 40 years ago when Eduardo Cruz Sr. purchased Jensen’s bar and package store on SW 27th Avenue, not far from Miami’s famed Calle Ocho, and transformed it into a full liquor store. Ten years later, his son acquired his own shop two miles north on NW 27th and added the Jensen’s banner. Between 1999 and 2016, Eddie added three more stores to the chain—one on NW 17th, one on NW 7th Street, and one on North Miami Avenue—and also acquired the original SW 27th location after Cruz Sr. retired. In addition to Little Havana, the stores serve customers of Miami’s Allapattah and Little Haiti neighborhoods. Like most urban stores, the Jensen’s Liquors venues are relatively small in size—ranging from 2,000 to 3,300 square feet. But they make up for their size with their clout, combining for annual sales revenue in excess of $15 million. Jensen’s strives to offer the best prices in the area—and if it doesn’t, the store will match any local competitor’s price. 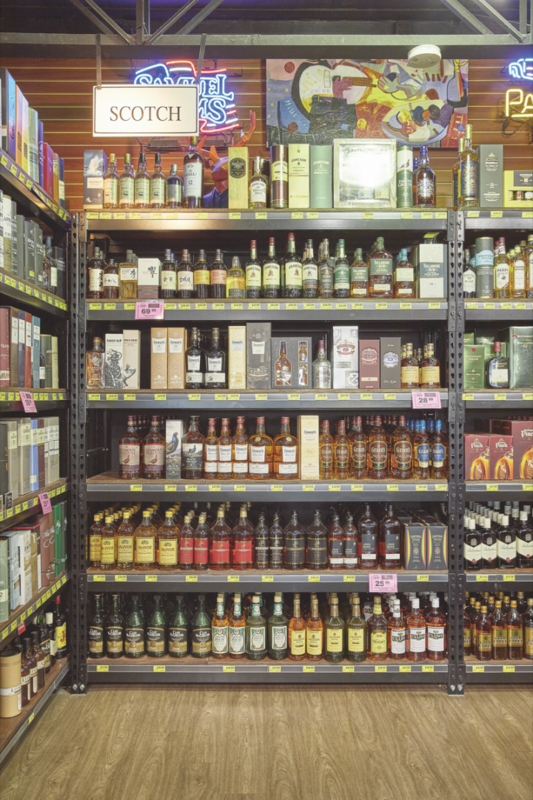 Spirits account for a whopping 60% of sales, with wine at 25%, beer at 10%, and miscellaneous items representing 5%. Jensen’s employs about 35 workers. Each of the stores has its own unique theme and decor, paying homage to its local neighborhood and Miami’s strong connections to art, music, sports, the outdoors, and drinks. The NW 7th Street store—which trades as Miami Liquors and is a short walk to Marlins Park—has a sports theme, while the NW 17th location features a dozen spirits-branded bicycles suspended from its high ceilings. 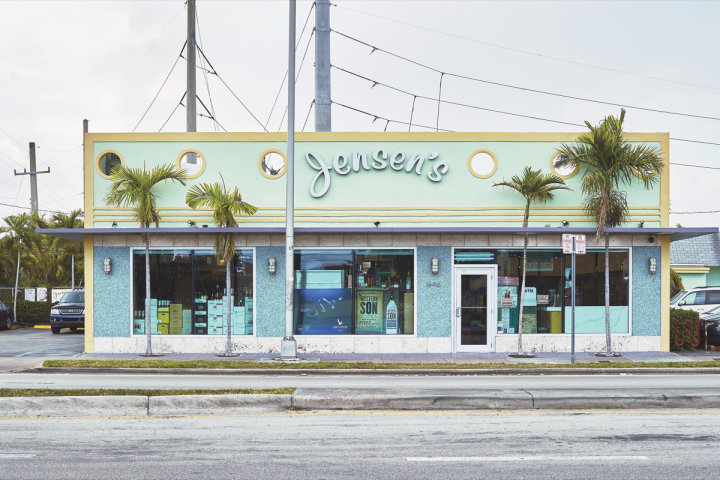 The SW 27th store—the largest of the five—has walls adorned with branded neon signs, and the shop’s pastel blue exterior lends itself to the Little Havana neighborhood. Product selection also varies somewhat depending on the neighborhood, Cruz explains. Most of the flagship store’s selling space is devoted to wine and spirits, although nine cooler doors for beer line the back wall and a refrigerated section in the front stocks cheese, olives, and other gourmet snacks. 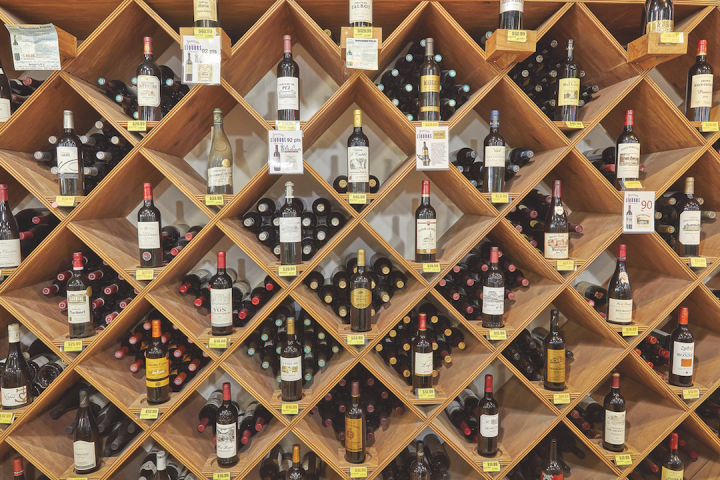 High-end wines are merchandised in wooden boxes on the store’s wine wall, which also features a wine closet bedecked with an iron door for prized bottles. Numerous floor displays include wooden barrel merchandisers, and gift baskets are sprinkled throughout the store. “This neighborhood is the gateway to Coconut Grove, Key Biscayne, and Coral Gables, so it does well with high-end products and hard-to-get spirits,” Cruz says. 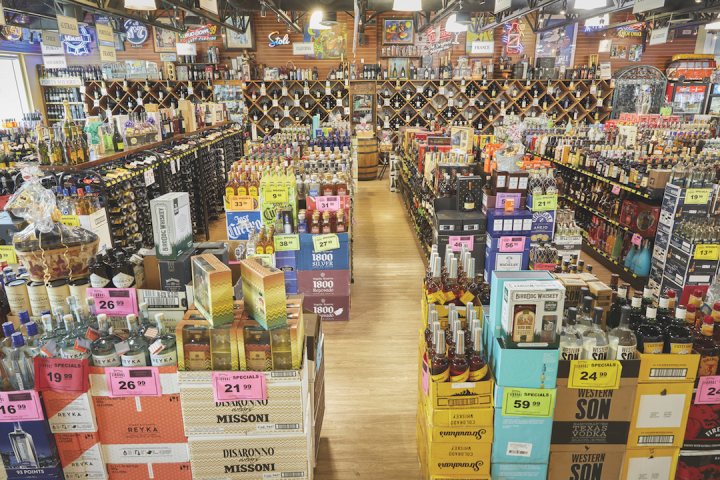 Jensen’s Liquors stocks some 8,000 SKUs in total—4,000 spirits SKUs, 2,500 wine SKUs, and 1,500 beer SKUs. Spirits range in price from $8 a 1-liter of Aristocrat vodka to $2,300 a 750-ml. of Pappy Van Winkle 23-year-old Bourbon. Top-selling brands include Johnnie Walker Black ($30 a 750-ml. ), Fireball ($16), Bacardi ($12), and Tito’s ($20). But when it comes to the fastest-growing products, Cruz mentions craft and high-end labels, especially those in the whisk(e)y category. “Bourbon has been huge for us,” he says. “When I first acquired the SW 27th store, a Spanish/Latin store in Little Havana, a $25 bottle of Bourbon was considered pretty expensive. Now, I can’t keep high-end Bourbons on the shelf.” Japanese single malts, such as Yamazaki 12-year-old ($150), are also “on fire,” according to Cruz. Like other retailers, Jensen’s has partnered on barrel programs with brands including Jack Daniel’s, Stranahan’s, Four Roses, and Patrón. Wines range in price from $5 a 750-ml. for Yellowtail Chardonnay to $3,000 for the 2014 Screaming Eagle Cabernet Sauvignon, but Cruz notes that the sweet spot tends to be in the $15-$20 range. Varietals like Pinot Noir and Sauvignon Blanc are popular at Jensen’s, as is rosé. While wines from California outsell every other category, according to Cruz, the stores also do well with Spanish wines. Indeed, the SW 27th location offers two full rows of Spanish wines. Top-selling wine labels at the chain include La Crema Sonoma Coast Pinot Noir ($22) and the 2013 Caymus Cabernet Sauvignon ($90) from California and the 2012 Tinto Pesquera Crianza ($34) and Protos Crianza ($24) from Spain. Beer offerings at Jensen’s range in price from $7-$13 a 6-pack. As with spirits, craft beer is driving momentum for the retailer; sales of major domestic brands have slowed considerably. Imports are also a significant factor, as witnessed by the four cooler doors devoted to the category at the Little Havana store. Top-selling brews include Heineken and Corona Extra (both $25 an 18-pack of 12-ounce cans), and crafts such as Funky Buddha Floridian hefeweizen ($11 a 6-pack of 12-ounce bottles). Along with cheeses, the stores’ refrigerated food sections stock gourmet items like chorizo, ceviche, and prosciutto. Additional miscellaneous items include barware, cigars, cigarettes, and lottery tickets. Free in-store tastings led by suppliers are frequent, especially on weekends. Three or four times a year, the Little Havana store hosts a day-long tasting event with multiple suppliers pouring products and complimentary food provided to customers. Perhaps the biggest initiative that Jensen’s has undertaken recently—and for which Cruz sees the greatest opportunity—is online sales, which the chain launched last year. “We’re doing better than I expected,” Cruz says. He estimates that online sales comprise about 3%-4% of total sales, with orders averaging $175-$200, largely driven by spirits. “We’re attracting people from throughout the country who wouldn’t ordinarily purchase from us,” Cruz says of his online customers. “Many tend to pick out high-end products.” Jensen’s also offers local delivery via Postmates and has partnered with Thirstie, an on-demand beverage alcohol delivery service. Cruz is already mapping out routes for future growth for Jensen’s. “We’ve been remodeling the older stores little by little,” he explains. “We’re going to keep doing that.” At the Little Havana location, he’d like to “knock down the warehouse and put inventory on stilts above the sales space to make room for more parking, and add a small deli as well.” And the retailer has more dreams for the future: Although he has no interest in expanding beyond the city’s borders, he hopes to add one or two more stores in Miami.